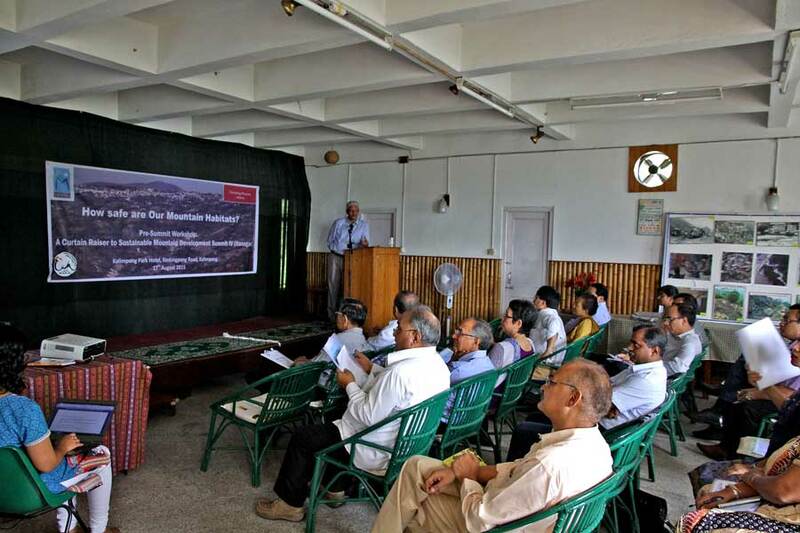 The workshop was organized by Integrated Mountain Initiative (IMI), a platform of diverse stakeholders working on issues pertinent to the Indian mountains. Darjeeling Mountain Initiative (DMI) a chapter of the IMI in Darjeeling district, (of which STH is a member) was the local host for this workshop. This workshop is a curtain raiser to the Sustainable Mountain Development Summit (SMDS) IV (Arunachal Pradesh) in October 2015. Participants from Arunachal Pradesh, Darjeeling, Mizoram, Nagaland, Sikkim, Tripura, Uttarakhand, FAO and UNDP as well as civil society representatives of the region gathered in Kalimpong to deliberate in the workshop.Dr RS Tolia, President IMI, MP Sikkim Mr. P.D. Rai and MLA, Darjeeling Mr. Trilok Dewan steered the discussions of the meeting. The panel of experts were- Dr Ajit Tyagi, former Director General of India Meteorology Department Pune, Dr Malay Mukul, Department of Earth Sciences, IIT Mumbai, Dr Chandan Ghosh, GeoHazard Dept, National Institute of Disaster Management, New Delhi and Dr Sunil De, Department of Geography, North-Eastern Hill University, Shillong. 2. Earth Quakes: The Himalayan states are highly vulnerable to high intensity earthquakes and places like Jammu and Kashmir, Sikkim and Darjeeling are in high-risk zones. More work on Earthquakes need to be done for other states of Northeast India. 3. Infrastructure: For rural and urban infrastructure which is rapidly spreading in the mountains, currently there are sophisticated and simple non-invasive techniques to test buildings for earthquake resistance. Additionally construction of roads, which is a key indicator of development in the mountains, needs to be reviewed thoroughly. Here too there are less stress causing, relatively low cost and simple methods that can be adopted with more engineering science. 4. Landslides: Detail maps for landslides are available for some sites and these need to be prepared across all scales from a landscape level to site level and even to a households level. These need to be made available to decision makers in different government sectors so that planning is disaster sensitive. 5. The bottom line is that mountains are highly vulnerable to disasters and so a paradigm shift in managing disasters is necessary from the current relief centric to more preparedness and risk reduction centric pathways. 6. IMI would coordinate and approach with the Governments of Sikkim, Arunachal Pradesh and Nagaland to take the panel of experts to these states and interact with Government Department making them aware about impending disasters in the mountain states. 7. A similar action was identified as being absolutely necessary for the Darjeeling to make the various sectors of the government aware about the vulnerability of Darjeeling to disasters. 8. The meeting agreed that coordination between the different departments of the government is necessary to make disaster risk reduction in the mountains more effective. As of now this cross-sectoral approach does not exist in most mountain states. 9. IMI with its local chapter Darjeeling Mountain Initiative would be an enabler in coordinating with the GTA to come up with a Darjeeling Hills specific Disaster Risk Reduction Strategies as per the need identified by the Hon MLA, Darjeeling. Additionally an assessment of various state-level Disaster Management Plans was also deemed necessary to address mountain specific needs for disaster risk reduction. 10. The proceedings of the meeting are further being collated and will feed into a DRR paper to be finalised in the Sustainable Mountain Development Summit to be held in Itanagar, Arunachal Pradesh in October 2015.